Mitsubishi Delica Space Gear SUPER EXCEED! No, really. We don't make this stuff up. The third generation of the mighty Delica boasted a turbodiesel powerplant and 4WD. This capability along with plenty of mirrors, lights, nerf bars, ladders, and roof racks transcended the Delica beyond mere space wagon and into super classification. 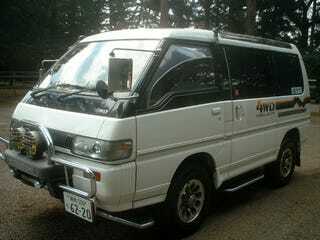 The Super Exceed was also offered as the Royal Exceed, and the Delica was even rebadged as a Mazda Bongo. The Delica is now in its fifth generation, and being sold under the not nearly as exciting Delica D:5 moniker. As Hello Kitty shows us in the video, the Delica remains both cavernous and versatile. Question of the Day: What&apos;s on Your Dekotora?